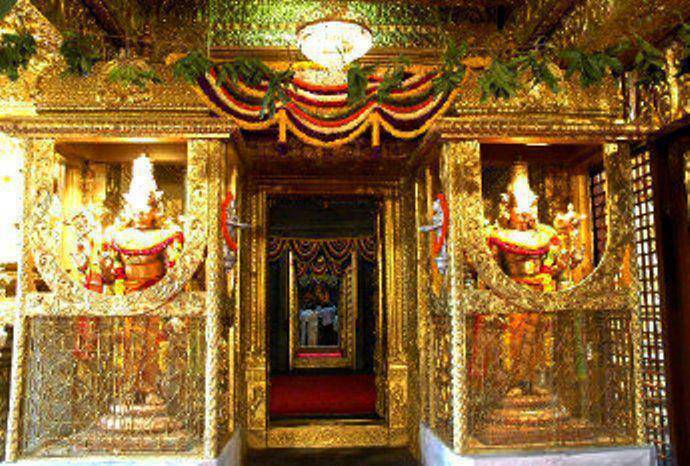 In the early hours of Wednesday the 18th of February, 2015..
A sannidhi golla (the cowherd of Temple),the Jeeyangar, the Archakas (the temple priests) the Peshkar of Tirumala Temple and all those associated with the formal procedure of opening the Bangaru Vakili (the Golden doorway) to the Garbha Griha of Tirumala Temple, to wake up the holy Lord Sri Venkateswara, have gathered right in front of the Bangaru Vakili..
For your info, the distance between the Bangaru Vakili to the Garbha Griha, wherein lies the principal deity or the moola virat of Lord Sri Venkateswara, is about seventy feet..
Every night after the Ekantha Seva is performed to Sri Varu, the doors of the main doorway or what is traditionally called the Bangaru Vakili are closed, locked and sealed at 12.30 a.m with a triplicate locking system. While one of the keys to this system lies with the Temple archaka, the second one lies with the Peshkar of the Temple and the third with the Jeeyangar..
On one of the very few eventful days in the history of Tirumala Temple, the visiting honorable President of Sri Lanka, His Excellency Sri Maithripala Sirisena, was scheduled to attend the Suprabhatha Seva that morning along with his entourage. Suprabhatha Seva, as you all may be knowing is the first Arjitha Seva performed at the Tirumala Temple, at 3 a.m everyday, to wake up the holy Lord Sri Venlateswara and His divine consorts from their celestial sleep (yoga nidra).. This pre dawn seva is performed at the Sayana Mandapa that’s there inside the Sanctum Sanctorum of the Tirumala Temple.. But before the commencement of this all important seva, there are a few important rituals that would to be performed everyday, inside the Garbha Griha of the Temple, strictly in accordance with the rules laid down by the Agama Sutras. These rituals include the opening of the Bangaru Vakili first, after which the Sannidhi Golla would step inside the sanctum sanctorum area and later the archakas, the Jeeyangar and the paricharika follow him chanting the sacred Vedic hymns. Then, the Sannidhi Golla would enter the Garbha Griha and after paying his obeisance to the holy Lord, would light up the oil lamps – other than the two eternal lamps – that are there in front of the Moola Virat. Later, the archakas and the Jeeyangar would enter the Garbha Griha after which the curtains will be brought down for a brief period. At the same time, on that eventful day of 18th February, 2015 all the important officials belonging to the Tirumala Tirupathi Devasthanams Board (TTD) were waiting outside the Temple, at the Maha Dwaram, as part of the official protocol, to ceremoniously receive the visiting honorable President of Sri Lanka..
And also at the same time..
An Archaka, reverentially placed the key of the door in the hand of the statue of the Dwarapalaka, that’s there on the right side of the Bangaru Vakili .. After that, he offered his pranama (salutation) to that age old statue. Later, he took out the key, which he had earlier placed in the hand of the Dwaarapalaka, and proceeded to open the lock of the Bangaru Vakili..
Firstly, he carefully inserted the key into the door lock and as every one standing behind him was silently observing him, he tried to click open the lock as casually as he does everyday. To his surprise, the lock didn’t open in the first attempt..
Then he made another attempt.. The same result.. Tried again.. And again.. And again.. And again.. Still the lock didn’t open despite all those attempts.. The hapless archaka then turned back and looked helplessly at everyone standing behind him..
His face was full of sweat that moment. Then the other two authorized key holders hurriedly opened the other two locks of the Bangaru Vakili, with the keys they have in their hands. and then tried to open the third lock that was refusing to open. But quite mysteriously they too have failed in all their attempts in opening the lock. That left them all flabbergasted. Then everyone, one after the other, still made a few more attempts to open the lock but shocking them furthermore that particular lock had not only refused to open but had also not allowed the keys to go out of the keyhole. This time there’s sweat on everyone’s face.. However, that sweat was not caused by the strenuous efforts they have thus far made to open the lock but by the fear signals that their minds were sending to their bodies, that moment..
More importantly, they have all, at that moment, failed to notice that a few valuable minutes that are so vital and precious before the commencement of the Suprabhata seva have already gone wasted by their useless attempts. The honorable Sri Lankan president was already on the way and was expected to enter the main Temple any moment. It was then that the panic button was pressed by the Temple staff there.. Mobile phones were drawn out.. Numbers have been dialed up.. Heightening the drama furthermore, the news about the arrival of the Sri Lankan President at the Maha Dwaram of the Temple had reached those dejected Temple staff members, who at that time were stranded in front of the Babgaru Vakili waiting for some divine help to come from some corner of the celestial world. As quite a few precious moments have already been lost in making vain attempts to open the lock, the vital info about the lock not opening was not sent on time to the higher officials of the TTD board. And it was then and exactly during those weak and helpless moments, a couple of members belonging to the Temple staff have expressed their regrets to their higher officials about the grave spiritual error they all have inadvertently committed on that morning ..
As the honorable Sri Lankan President had by then entered the main Temple area accompanied by all the major officials of the TTD Board including it’s newly appointed Executive Officer Sri D Sambasiva Rao..
That the shocking news about the lock of Bangaru Vakili not opening had finally reached the E O.. He just remained numb for a few seconds.. However, he quickly came out of that state and had ordered for some quick measures to break open the lock.. Immediately, the gas welders were pressed into service.. Using gas welding machines, the welders have quite successfully opened the lock giving great relief to the entire temple staff there, that day.. Finally, according to the news sources, at about 2.48 a.m the all important sacred Vedic procedure, that precedes the Suprabhatha seva, began in the Garbha Griha of the sacred Tirumala temple. Later, this was what the deputy executive officer of the Tirumala Tirupathi Devasthanams (TTD) board, Sri Chinnamgaari Ramana had said – while reporting this rare incident that occurred for the first time in the five thousand year history of the Tirumala Temple – to the news agencies, that day.. However, at this point of time there’s no need for me to guess and write how much time, on the whole, was lost while trying to open that lock and later to break it open that day.. I also know my beloved readers are wise enough and can as well imagine and understand how much precious time must have been lost during that entire lock opening and lock breaking process that day.. Honestly, we have no other option except going by what the deputy E O had said that day, just because he had sworn by the name of Lord Sri Venkateswara under Whom he’s working.. Even otherwise things went off well, later in the day at the Tirumala Temple, albeit with a little anxious waiting for the honorable President of Sri Lanka, His Excellency Sri Maithripala Sirisena..
At least from a human and scientific point of view.. But is that all the TTD want to reveal to the devotees or is there anything else that they are hiding from us..???.. And then what about the most crucial divine point of view in this case..??? Yes.. The TTD is certainly hiding something very vital from us which when looked from a divine point of view would give a more meaningful justification to the whole drama.. This was exactly what had happened that day and it was for this reason a couple of Temple staff, may be the Archakas, regretted that spiritual error during those helpless moments.. In their eagerness to welcome the honorable Sri Lankan President and just to enable him spend a few extra minutes in the presence of the holy Lord Sri Venkateswara, the over zealous authorities of the Tirumala Temple, have decided to wake up the Lord from His Yoga Nidra five minutes ahead of time. Which means, instead of opening the doors of the Bangaru Vakili at 2.20 a m, as they would normally do everyday, the authorities on that eventful day, have decided to open them at 2.15 a.m which was spiritually a grave error. 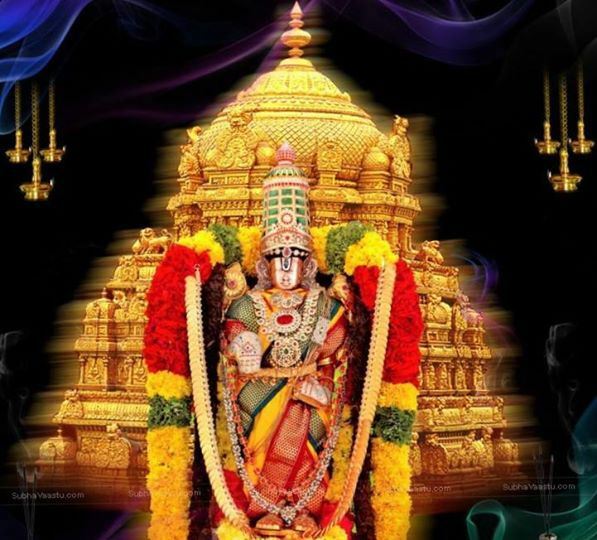 The readers here need to know that all the sevas and kainkaryams to Lord Venkateswara in Tirumala Temple are performed strictly in accordance with the timings and guidelines recommended by the Agama Sastras.. It means no one is either empowered to amend them nor to alter. Despite knowing this point well why is that the TTD authorities have tried to disturb the celestial sleep of the Lord.. They all are aware that anyone trying to do so, even though inadvertently, would be punished by the Lord.. Still why is that they have dared to do that..??.. “That was a just a human error and there’s no need to look at anything beyond that “, they are, however, not willing to talk about that great spiritual error which they have, either knowingly or unknowingly, committed that morning. 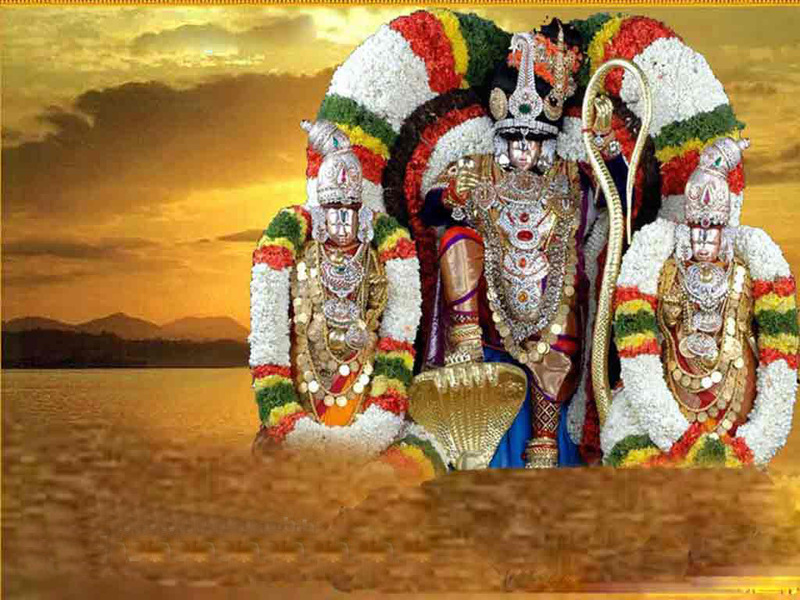 “To wake up the holy Lord Sri Venkateswara five minutes ahead of time, must have certainly infuriated the Lord and as a result everything on that day had gone for a toss in the holy Tirumala Temple”. There’s no room either for an error or indiscipline in the kingdom of Lord Venkateswara.. He strictly follows a discipline and expects us to follow the same.. Therefore the discussion here is not just about the question of waking up the Lord five minutes in advance but about the undisciplined attitude of the TTD authorities who could not weigh their options properly and tried to give more importance to a man than to the One who created him..
Before standing up to raise any criticism against me, please note that this whole article as well as my observations thereupon are based entirely on a news item that was published by popular Telugu newspaper SAAKSHI on Thursday, the 19th of February, 2015.. If you have access to this newspaper today you may refer to it for clarification.